How do I cross-list a section in a course as an admin? 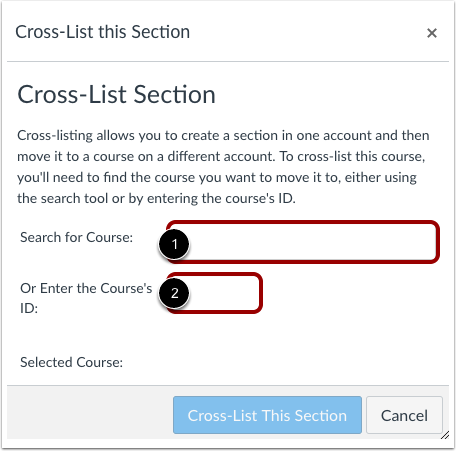 Cross-listing allows you to move section enrollments from individual courses and combine them into one course. 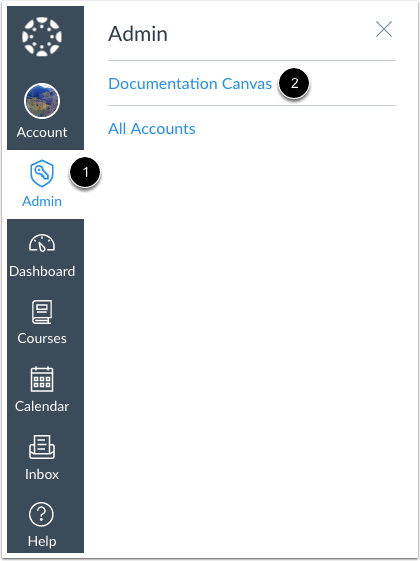 This feature is helpful for instructors who teach several sections of the same course and only want to manage course data in one location. Instructors can allow students to view users in other sections or limit them to only view users in the same section. Section names do not change when they are cross-listed; the section is just moved to another course. Cross-listing should be done while courses are unpublished. Coursework is retained with the course, not with the section enrollments, so if a published course is cross-listed, all cross-listed enrollments will lose any associated assignment submissions and grades. To cross-list a course, you must know the name of the course or the course ID into which you are cross-listing. However, using a course ID is a better way to confirm you are cross-listing a section into the correct course. You can find the course ID by opening the course and viewing the number at the end of the browser URL (e.g. account.instructure.com/courses/XXXXXX). Sections can only be in one course at a time. Once a section is cross-listed, you can re-cross-list the section into another course if necessary. You can also de-cross-list a section. This lesson shows how to manually cross-list a section, though cross-listing can also be done through SIS imports. For more information on cross-listing, view the cross-listing video. Note: Before you can cross-list a section, the course must contain at least one enrollment. Use the filter and search options to find the course from which you are cross-listing in the account. In the search results, click the Settings link for the course from which you are cross-listing. Click the title of the section you want to cross-list. Click the Cross-List this Section button. In the Search for Course field , enter the name of the course into which you are cross-listing. Or, in the Course ID field , enter the ID number for the course. Confirm you have selected the correct course . Click the Cross-List This Section button . The cross-listed section now appears in the new course. The breadcrumbs show the new course code. Sections can only be in one course at a time. 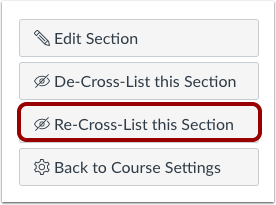 If you need to cross-list the section into a different course, click the Re-Cross-List this Section button. Previous Topic:How do I use cross-listing in an account? 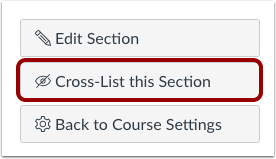 Next Topic:How do I de-cross-list a section in a course as an admin? 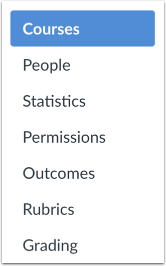 Table of Contents > Courses and Sections > How do I cross-list a section in a course as an admin? Re: How do I merge course sections in Canvas? Re: Is there a way to combine courses? Re: Will I lose submissions when I cross-list?